Installation of Gassed by John Singer Sargent. 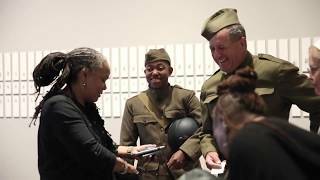 Artist Debra Priestly and Tennessee State Park Ranger & Historic Interpreter Tony Mitchell discuss Priestly's piece "somewhere listening: Company B, 365th Infantry Regiment, 92nd Division, A.E.F. 1918-1919 (2014)"
Today, nearly a century after it ended, World War I (1914–1918) remains a stark example of how far modern civilization can descend into violence. The United States, led by President Woodrow Wilson, entered the war only in April 1917 and helped bring the conflict to an end in November 1918. Even though the United States was involved in active fighting for a relatively short time, the war set into motion political and cultural changes still with us today. The conflict’s intensity and size led its participants and observers to seek a new visual language to describe it. American artists were vital to the culture of the war in several ways. They developed imagery that promoted US intervention and made daring anti-war cartoons. Some worked as official war artists embedded with troops. Others designed camouflage or took surveillance photographs. On the home front, some were vocal about the war and exhibited ambitious works of art in response to events, while others dealt with wartime anxieties in personal ways. In the decades after the conflict, many artists reflected on the significance of their war experience or pondered the war’s reverberating effects on the country. World War I had a pervasive presence in the lives of Americans, before and after the United States entered the hostilities, and artists of all generations, aesthetic positions, regions of the country, and political points of view took notice and reacted. This exhibition provides an unprecedented opportunity to examine World War I and its impact on American art. George Bellows, Marsden Hartley, Childe Hassam, Georgia O’Keeffe, and John Singer Sargent are among the more than seventy artists whose response to the Great War is explored. Timed to coincide with the centenary of the United States’ entry into the First World War, this exhibition takes an expansive look at America’s wartime visual culture through the works of more than seventy artists, including George Bellows, Marsden Hartley, Childe Hassam, Jane Peterson, Horace Pippin, John Singer Sargent, and Edward Steichen. Drawings, films, magazine illustrations, newspaper cartoons, notebooks, paintings, photographs, posters, prints, and sculptures gathered together from sixty public and private collections, including the Imperial War Museums in London, tell the multifaceted story of World War I and American art. Contemporary works by Debra Priestly and Mary Reid Kelley attest to the continued relevance of the war today. Known as the Great War because of its unprecedented scale, World War I began after a Serbian nationalist assassinated the heir to the Austro-Hungarian throne, Archduke Franz Ferdinand, in 1914. Alliances gradually drew all the major European powers into the war, and then it spread around the globe. The United States remained neutral until April 6, 1917, when it joined forces with the Allies (Britain, France, Italy, Serbia, and Russia) fighting against Austria-Hungary and Germany. The American military proved decisive in helping the Allies win the conflict. Peace came on November 11, 1918. The US government waged an impressive propaganda campaign to raise money and troops for the war. Four million copies of the iconic red, white, and blue poster were produced by the government’s Division of Pictorial Publicity in 1917 alone. Plastered on the walls of factories, post offices, schools, and shops, I Want YOU and other war posters were ubiquitous. The United States issued more propaganda posters than all the other nations at war combined. Thirty years old in 1917, artist Claggett Wilson volunteered for the Marines and was one of more than two million American men sent to fight in Europe. In the summer of 1918, he was gassed and wounded in the month-long Battle of Belleau Wood. Afterward, Wilson recalled his experiences in brilliant watercolors, twelve of which are in this exhibition. Like the narrator in the German World War I novel All Quiet on the Western Front, the artist communicates the brutal realities of modern warfare. In Dance of Death, the painter, looking out at the world from the trenches, depicts three German soldiers who had bravely charged across no-man’s-land to fight, only to lose their lives after becoming ingloriously tangled up in barbed wire—a new low-tech weapon. Because it was too risky to retrieve the corpses while the battle continued, they suffered the indignity of being left to hang on the “devil’s rope,” as barbed wire was called during the war. For the scene, Wilson revives the Dance of Death motif first used in Western art centuries earlier, at the time of the Black Death, which similarly devastated millions of lives in Europe. Wilson’s choice of medium is also meaningful. Prior to the war, watercolor had become a quintessential American art form and was employed for light and cheery subject matter—the pleasures of sight. The war, however, prompted Wilson and many other artists in this exhibition, including Ivan Albright, to use watercolor’s immediacy and intensity to portray the grim themes of exploding bombs, traumatized soldiers, maimed bodies, and death. With these and many other works of art, this exhibition provides the opportunity to look back one hundred years later at the First World War, take stock of its incredible magnitude, and see the international conflict with the passion and sensitivity of American artists who lived through it. World War I and American Art was organized by the Pennsylvania Academy of the Fine Arts. World War I and American Art at PAFA was made possible in part by a major grant from the National Endowment for the Humanities: Exploring the Human Endeavor, and from the Henry Luce Foundation. Additional funding provided by grants from the David A. and Helen P. Horn Charitable Trust, Edwin L. Fountain, the Wyeth Foundation for American Art, The McCausland Foundation, the General Representation of the Government of Flanders to the USA, Mrs. Helen Horn Bickell, Carolyn Horn Seidle, Ellen and Leonard Milberg, Furthermore: a program of the J.M. Kaplan Fund, Bank of America, Mr. and Mrs. Beat Curti, Mr. and Mrs. Kevin F. Donohoe, Connie and Jules Kay, Dr. and Mrs. J. Brien Murphy, and Ken Woodcock. This exhibition is supported by an indemnity from the Federal Council on the Arts and the Humanities.